Amazingly, there has never been a DC villain called the Red Herring. If there were, he’d be a shoo-in for this show – some Puppet Master-style evil overseer, confusing the characters with a series of deliberate misdirections. Be honest, right at the start of “The Sound And The Fury” you thought – just for a moment – that it was Barry phoning up and threatening Wells. Especially when, for the first time in the show, we explicitly see Wells creating the “red” lightning when he runs at super speed (a great “Ooooooo!” moment). This has to be the start of the showdown between Future Flash and Reverse Flash, surely? But no. It’s Hartley Rathaway, now going by the name of the Pied Piper, who’s out for Wells. The smoke and mirrors don’t end there. 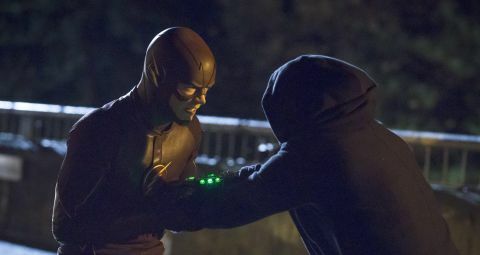 Later in the episode, Hartley tells Wells that he’ll reveal his secret and you think he must mean about being a speedster, especially after Rathaway tells Barry archly, “One day this man will turn on you in a flash.” But again, no – he’s referring to the fact that Wells knew his reactor could explode. The Pied Piper is a curious villain, and not just because his code name only makes sense if you know his comic history (where he did originally hypnotise people with music). Cisco might approve of the name, but you’d have thought that left to his own devices – based on the powers Rathaway has shown – Cisco would have come up with the name “Vibe”… except that may have caused problems in the future. Andy Mientus, who plays Hartley Rathaway, auditioned for the role of Barry Allen. Rathaway looks, frankly, bobbins in his costume, but that may be point. He has the appearance of an eight-year-old boy with his anorak hood up and using the rest of the coat as a cloak; maybe that’s why the Flash knocks him down with a playground slap then throws sticks at him. It all looks a bit silly for a super-powered smack down. Hartley does redeem himself, though, with the line “Being scooped up by a guy clad in head-to-toe leather is a long time fantasy of mine, so thanks.” Plus, he’s a good schemer. Just not as good as Wells, clearly. Speaking of whom, Wells must have some bloody good lawyers. After his press conference, how come he’s not arrested for manslaughter or criminal negligence at the very least? Elsewhere, Iris’s plot line suddenly takes a turn for the interesting with her new job at Central City Picture Post. Admittedly, it was obvious she’d somehow impress supercilious reporter Mason Bridge by episode’s end, but the fact that she realises she’s only been employed because the editor thinks she has a hotline to the Flash adds an interesting dynamic. As does the fact that Barry, oddly, doesn’t seem in any hurry to help her out. Grant Gustin is great as usual especially in the sentimental, out-of-nowhere “you were a great surrogate dad” scene with Joe which he sells despite some cheesy dialogue. It also helps that the syrupy moment is immediately followed by a harder-edged Joe telling Eddie to continue the investigation into Wells. The Pied Piper was first introduced into the DC comics universe in The Flash volume one, #106. He was a villain until after Barry Allen’s death in Crisis On Infinite Earths (1985-6) when he went “straight” and then (even he noted the irony) came out as gay. In New 52 continuity he is the conductor of Central City's orchestra and the boyfriend of Barry’s boss David Singh. They may have looked like they’d just wandered in from Gotham (or the Dark Knight trilogy) but the Royal Flush gang are a bunch of second-tier goons who’ve appeared in various DC comics since they first appeared in Justice League Of America #43 (1966). Infamous for being hired by Booster Gold specifically to make him look good when he beat them. Talking of the Royal Flush Gang, in the initial chase scene, we were impressed with a) the way the three bikers are labelled K(ing), Q(ueen) and A(ce) on Wells’s computer, and b) the way Wells can instruct somebody moving as fast as Barry to go “left” and “right” at just the right moments. Is this a subtle reference to the fact that Wells has super speed powers too? How come Cisco and Caitlyn aren’t suspicious? The return of Bobby “Bovine” McFeely – Central City’s legendary hero last referenced in “Going Rogue” (in which there was a big display devoted to him at the city museum). In this episode he’s on one of the classic Central City Picture News covers on the wall of the newspaper’s meeting room. People living in glass houses shouldn’t really have secrets… like the fact that they can actually walk despite everyone thinking they’re wheelchair-bound. The glass may be tinted (though it doesn’t look like it) but you’d think someone as security-conscious as Well would live in a lead-lined house. Iris calls the news editor “Chief” and he asks that she doesn’t call her that, proving that he’s from the Perry White school of editing. Wells’s AI Gideon announces, “Speed Force absorption at 35%”. In the Flash comics, the Speed Force is an energy "well" from which all DC's speedsters draw their powers. There isn’t a character called Mason Bridge in the DC comics universe, but there is minor one called Mason Trollbridge, who was mates with Wally West, another version of the Flash. He was also, briefly, a tribute act to a ’30s superhero called the Clipper, taking up the mantle of the crime-vigilante who “clipped” the ears of the villains he defeated (and who rescued him as a kid). One of Wellss old colleagues turns nemesis in the guise of the Pied Piper.